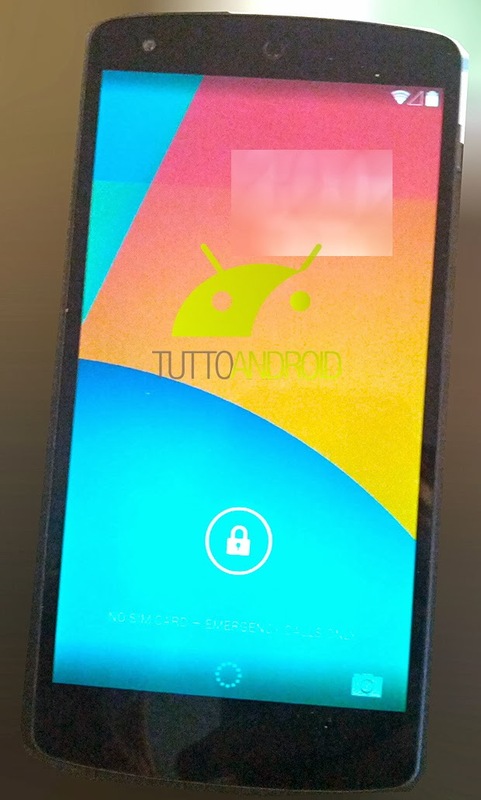 Google Nexus 5 and Android Kitkat 4.4 is the hottest highlighted news now these days on websites, Few days back we also post a news about Leaked photo of Google employee capturing photo via Nexus 5. 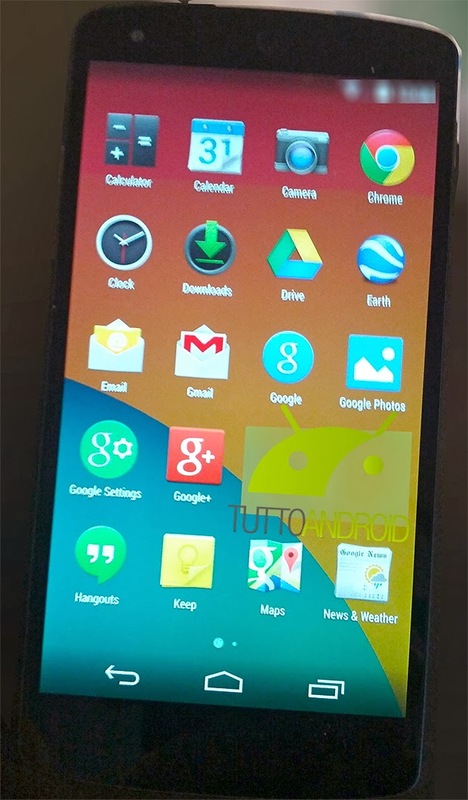 But now another big news of android kitkat 4.4 "Here are some photo leaked of the Android Kitkat 4.4 version" via TuttoAndroid website. 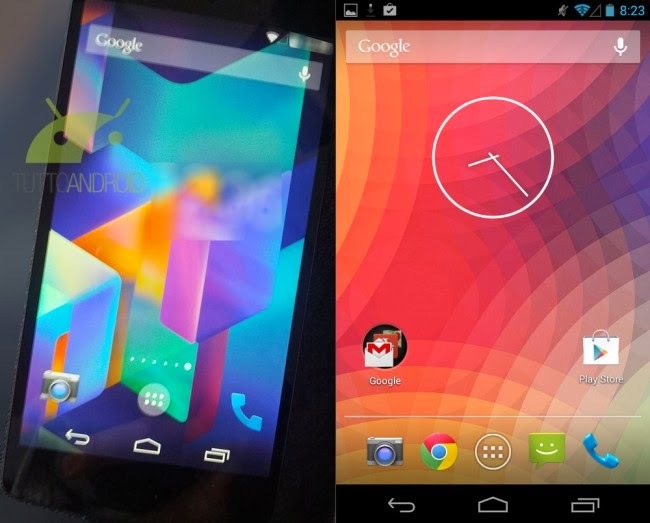 There are huge diffrence between nexus 4 vs nexus 5, transpaprent (new icons, new transpaprent notification, app drawer, three main button of nexus 4) you can see these pictures, All photos captured of officialy lg nexus 5 integrated android 4.4 we don't think this if fake picture of android 4.4, we think you see this in your nexus 4 android smartphones on it's release date OCT 15th. On previous nexus phone google android 4.3 jelly bean have black notification bar, which now you can see transparent or also the touch buttons black stipe line made transparent, Now display look much better or bigger than jelly bean. And google has added a camera app direct on lockscreen so you go to camera through one touch on screen. 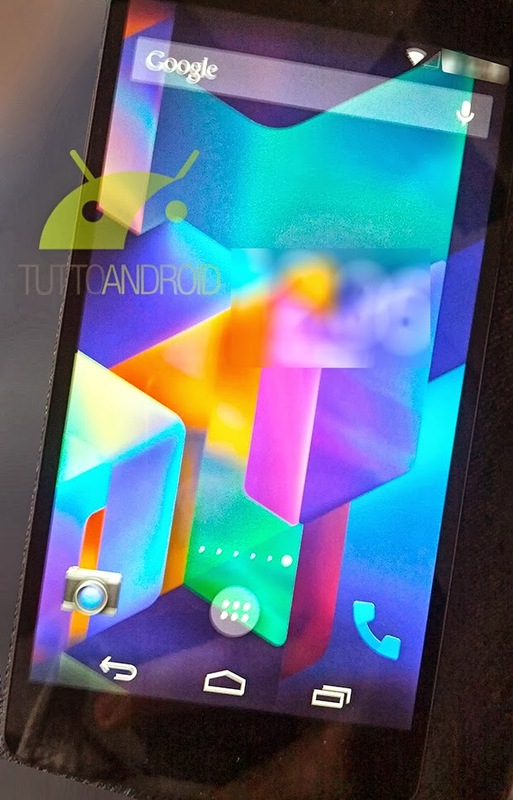 Another great innovation for the new officialy android 4.4 launcher. As we can see on this image previous App Drawer (Application drawer) is now no longer the white border with you see above your launcer button, now it's been changed to small dot's. Three main buttons has no backround it is simply awesome design. On galaxy nexus we saw the 4 apps grid icons line but after galaxy, on nexus 4 we see changed it has bigger width display so it have 5 apps icon lines on it. This time android kitkat back to it old design on nexus 5 bigger icons and transparent app drawer background. 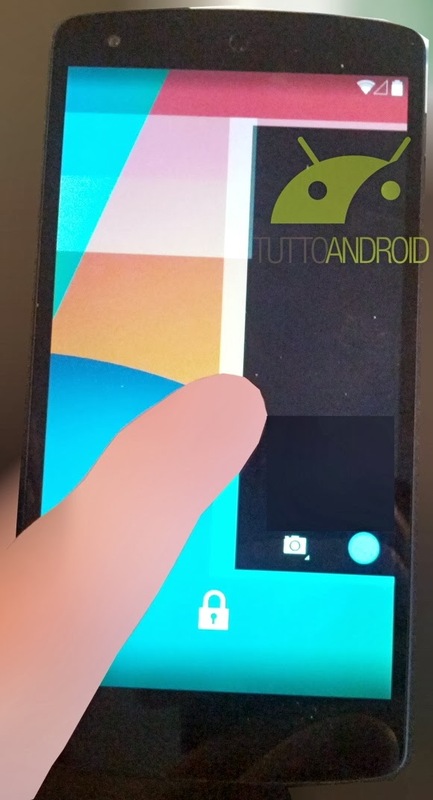 Another leaked picture of new nexus 5 with android 4.4 Swiping the window to open camera app same like in old version of android, while the center white circle is not remained the same.